A new review of 23 leading Principles of Economics texts reveals huge differences in the coverage of government failure versus market failure. Jim Gwartney, who is the author of a leading text with a strong emphasis on public choice, along with his colleague Rosemarie Fike, conducted the review and posted the results here. Jim and Rosemarie went through each of the 23 introductory texts looking for and tabulating references to various types of market failure and government failure. As they explain in the paper they also categorized the explanations of market failure (say due to externalities, public goods, market power,…) and government failure (say due to special interests, short-sightedness, rent-seeking,…). Different people can have different views about the criteria and about models of public choice and government developed by James Buchanan, George Stigler, and others. But the paper endeavors to describe the methodology carefully, and I recommend reading it to get an understanding of the results. The following is Table 3 of the paper. 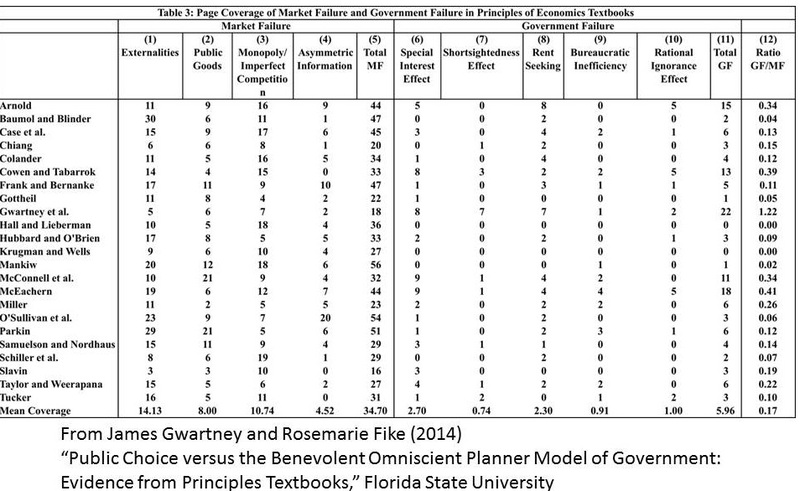 It shows the ratio of page coverage on government failure to page coverage on market failure in each text. Other metrics reported in the paper give similar results. The Paul Krugman-Robin Wells book is tied with the lowest ratio (0.00) along with the Robert Hall- Marc Leiberman book. With more references to government failure, Gwartney, Cowen-Tabarrok, Arnold, and McEachern have much higher ratios. It is interesting that the ratios in Baumol-Blinder and Mankiw are quite low, especially in comparison the Samuelson-Nordhaus ratio which is just a bit below the average. The ratio in my book with Akila Weerepana is a bit above the average. Reviews like this can affect future texts and revisions as authors and users become more aware of the overall coverage in comparison with the market. My guess is that future reviews will show an increase in the average ratio and some small reduction in the variance which preserves the overall diversity.